Click image to enlarge. More details online and on Facebook. 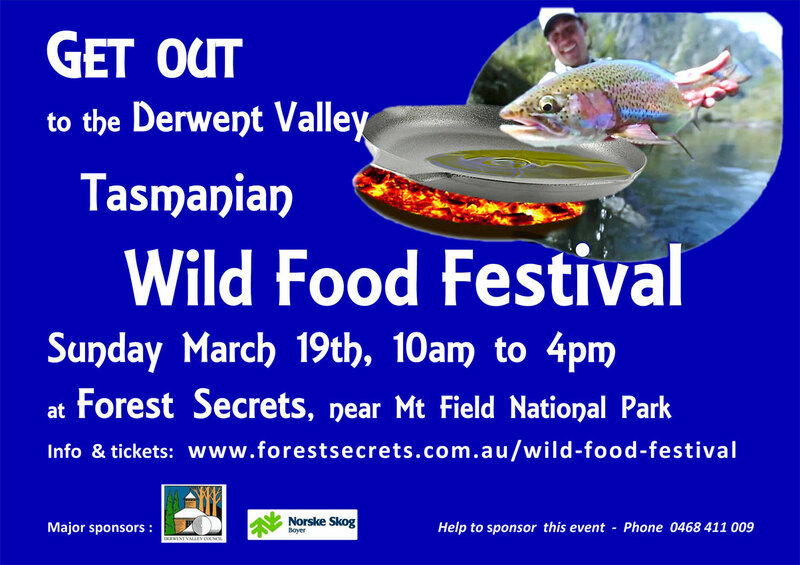 THE first Derwent Valley Tasmanian Wild Food Festival will be held at National Park this Sunday. The organisers invite food-and-fun lovers from all over to head to the Derwent Valley to experience and celebrate Tasmanian foods that are harvested and caught in the wild. Hosted by Forest Secrets just outside Mt Field National Park, the line-up will include a range of food, beverages and entertainment on offer - from native berries, to new season leatherwood honey and gourmet trout and eel, to grubs and choc-coated insects and more - all offered by Tasmanian community groups or businesses. Wild beers, weed salads and plenty of vegetarian, vegan and gluten free choices will be available too. Sponsored by the Derwent Valley Council and Norske Skog Boyer, the festival will run from 10am-4pm. Entry costs $13 for adults (ages 16 and over) and $8 for children (ages 4-15). More details online and on Facebook.